Arisaig in Wells-next-the-Sea sleeps 5 people. This spacious detached house is set in a quiet location within easy reach of the popular coastal holiday resort of Wells-next-the-Sea, with its busy fishing quay, traditional town centre with shops, bank, cafes and excellent inns. A mile away are the pine woods and sandy beach accessed by car, on foot or take a ride on the harbour miniature railway (seasonal opening). Sailing, fishing, bird watching, walking and cycling are all available. Holkham Hall and beach 2 miles. Visit Morston Harbour for boat trips to see the basking seal colony, or Stiffkey, Cley-next-the-Sea, Blakeney and Salthouse marshes for coastal path walking and RSPB and nature reserves. Shop and pub 500 yards. Living room with gas ‘coal-effect’ fire. 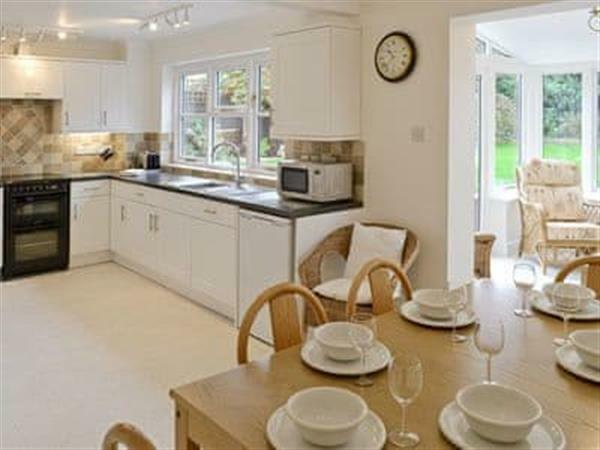 Spacious kitchen/dining room with TV and garden room. Shower room with toilet. Separate toilet. First floor: Double bedroom with 5ft bed and TV. Twin bedroom with TV. Single bedroom with 4ft bed. For a better idea of where Arisaig is, you can see Arisaig on the map below. Arisaig is in Norfolk; should you be on the lookout for a special offer, you can find all the special offers in Norfolk. It's always worth checking to see what is on offer at the moment. Do you want to holiday near Arisaig (CCCC), you can see other cottages within 25 miles of Arisaig; have a look to find your perfect holiday location.